Augsburg Fortress Publishing, 9781506434315, 200pp. 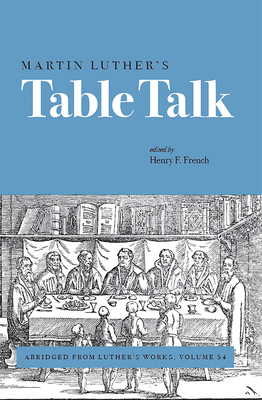 This volume provides access to selections from Martin Luther's Table Talk, Volume 54 of Luther's Works. Editor Henry F. French has carefully chosen some of the best of Luther's conversations with many guests who frequented the dinner table in the home of Martin and Katie Luther. Those who read this book will join the conversation with Luther and friends as they wrestle with important questions of the day. Pull up a chair and join the circle. Henry F. French has written a brief new preface to introduce this abridged volume.